Click or tap image to download a free .pdf of this article. 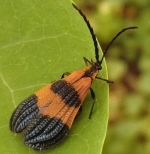 (The insect is a Banded Net-wing Beetle, Calopteron reticulatum. )Yesterday evening for the second time in two weeks I received a text message on my iPhone saying that an ordered item had been delivered from Amazon BEFORE the item was actually delivered. Last night I went to bed before it arrived. I found the box on my front porch this morning. I bring this up since I see this as an instance of there being a possible slip-up between the physical and electronic as we move more and more to integrating the two in our retail channels. For example, see Brian Proffitt’s report Etail Innovations Blur Line Between Physical, Online Shopping. In that report he describes efforts to combine electronic product displays with smartphone-based ordering. In theory, I like the idea. In practice? In my case, thinking about my experience with Amazon delivery, I don’t know whether the “your package has been delivered” text message was sent automatically or by a delivery staff member eager to meet a performance deadline. In both my cases there were no real consequences but I think it’s easy to imagine instances where there might be. For example, imagine a father landing at Gatwick (a location mentioned in Proffitt’s article) from a business trip and being asked by his wife at home to pick up some baby formula on the way home since she is sick in bed, can’t get out, and the cupboard is bare. Dad stops at the airport’s electronic store, orders a package to be delivered immediately from the electronic display, then his phone dies after receiving order acknowledgement. He drives home, safe in the knowledge that he has fulfilled his fatherly duties. Meanwhile, the fulfillment/delivery shop finds that the inventory system is in error and that the shelf where the baby formula is stored is actually bare; they don’t find that out for 15 minutes because the robot item picker is down for repairs and a human operator has to check the shelf only to find an empty spot. They try to email or phone dad but his phone is dead and, being a young and modern couple, they have no land line listed as an alternate contact method. Dad gets home and suffers the consequences. Scenarios like this may be one reason why brick-and-mortar shops don’t entirely disappear. We’re all familiar with sequences of events like these, where a confluence of events leads to a breakdown at some point in a series of linked actions that are governed by both manual and automated processes. 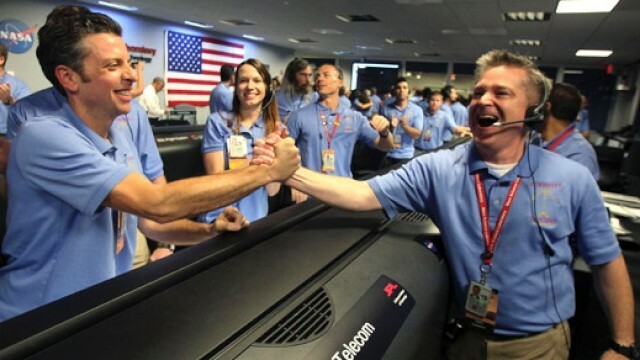 Sometimes they work; witness the successful landing of Curiosity on Mars this past week. Copyright (c) 2012 by Dennis D. McDonald, Ph.D. Dennis is a Washington DC area consultant specializing in collaborative project management and new technology adoption. His clients have included the US Department of Veterans Affairs, the US Environmental Protection Agency, the National Library of Medicine, the National Academy of Engineering, and the World Bank Group. Contact Dennis via email at ddmcd@yahoo.com or by phone at 703-402-7382.